As anyone who has ever had to trek barefoot across a sandy beach knows, beaches are usually made up of two portions. The upper part, which the sea hasn't touched since the last hurricane, and the lower part, where the waves have left the sand wet. Now, the lower part is usually made up of firm sand, easy to walk on and newly cooled by the water. That part does not present a problem. The upper part, however, is covered with loose sand that is hot enough to charbroil your tootsies in under five paces. Nevertheless, if you scoop off the top half inch or so, you will find the sand underneath to be much less hot, even cool to the touch. While some hotels are enlightened enough to provide sprinklers to cool down the path to the sea, those of us venturing off the beaten track or using a public beach are out of luck. So, I propose the sand mower. This device is remarkably similar to a hand-pushed lawn mower, except that the blades are absolutely and completely blunt, extend an inch or so above and below the wheels, and are cunningly curved to constantly scoop the loose sand away from the middle and out to the sides, which it is deposited. Thus, a narrow path is formed of cool sand, that the device's user can stroll down, along with family and any other tag-along stragglers, barefoot and carefree. Maybe you could push a snowblower in front of you. Or if it had a big water tank on it, and you really wet the sand, you could swim down to the sea through the quick sand. Just drink lots of water about an hour before departing for the beach. Also good for Athlete's Foot. I'm thinking it would be just darn hard to push. Loose sand is hard to push wheels through and having blades extend into the sand would make it not unlike pushing it through concrete. I suppose some big balloon tires might help keep the wheels atop the sand but those blades . . . .
Maybe if it was powered. oh come on [waugsqueke] we do half baked ideas here, I hardly think shoes clasify. You could avoid the push vs. power issue altogether by driving a team of trained domesticated crabs in front of you as you go. Yes, but only so with the elite, dextrous breeds. The economy lines just steal someone else's towel for you. Might be able to teach some to fiddle. You know, I never knew her name was Eunice. It changes my whole perspective on life, it does. You could ride piggy-back on a giant sea monkey that hot-foots it to the surf. If you had some cylinder shaped like an Archimedes screw which moves the sand out of the way rather than simply trying to push it out of the way, this could well be doable. Although maybe you'd need to do less than 0.5 of an inch - that would weigh rather a lot. In the UK we're lucky if a beach ever gets past the barely freezing stage but I dread to think how much more clutter this would mean on our family's excursions. Already half of the stuff gets left in the car. I'm thinking a small donkey and an inflatable plough. Cedar Park: not good on two counts: a) noise pollution; b) eye hazard down wind. bristolz: we're not talking about a lot of sand here, just a two foot swath half an inch deep. The blades ought to be able to scoop that out of the way without too much effort. PeterSilly: the cunningly curved blades are already acting like an Archimedes screw. And I doubt this product will *ever* be needed on British shores (even if the beaches get hot enough, they're covered in rocks and pebbles anyway ;). What [po] said - there are some devastatingly beautiful sandy beaches around the north and west coasts of Britain. The fact that you can't walk on them barefoot without getting frostbite doesn't detract from their scenic beauty, nor their Sahara-like qualities. I'm with bristolz, I think this thing would be very hard to push at all. I think your estimate of half an inch of sand is highly optimistic, my experience is that away from the water you have to move quite alot more sand than that to get past the hot layer. Think about a push mower in even moderately heavy lawn. If you come to a stop, if you let the blades stop, it is *very* hard to push and get the blades spinning again without backing up into an area already cut and getting a running start, spinning the blade up, to push into the uncut region. Now imagine a much more unyielding substance and one where, unlike the lawn example, you are trying to move 100% of the surface area to a depth of half an inch. Maybe if the device furrowed the sand in some way-- turning the top layer aside at a very narrow angle to the direction of travel--it wouldn't be so hard; or maybe like the Archimedes screw [PeterSilly] mentions. Maybe your cunning curvature does this already but I think turning aside 40-50% of the sand a very small distance would make a considerable difference in your footy's perception of the surface temperature and be much easier to contend with than trying to move all of it aside. Can you use it in the winter to clear snowdrifts? 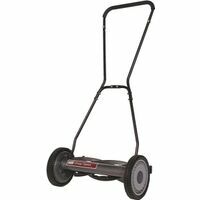 bris: the blades on a regular mower are hard to get going because they're heavy and spin fast, and you have to provide the angular momentum to get them moving in the first place. I believe the blades on this device could be light and turn only as fast as the wheels, so all your energy would go into shifting the sand. krelnik: nope, I've done research - half an inch is good enough, even on the hottest beaches. Besides, you're moving that 14.5 foot length of sand one or two inches at a time - maybe a pound at a time, if your numbers are right. And you're sliding that sand sideways, not picking it up and hurling it. We could, after all, replace this device will a kind of wheeled snowplough. Maybe a four-wheeled snowplough to stop it ploughing into the ground. I remain reasonably convinced this could work, but the proof would be in the contruction, and the engineering is entirely beyond me. What you need here is a sand tiller. This would be like a regular tiller, but would have sand in the name. See? But what would be really great would be to have fluffy sand, fluffy like ashes so that it contained a lot of air. Then it would be a great insulatoreven if it was two thousand degrees out, you could still walk on the beach without burning your toes. Just like those fire walkers. Just take a pair of oven mitts and walk on your hands. How about a plough-shaped device, which would just push sand to the sides and maybe have a wheeled dolly to keep from going too deep. I don't think this would be so hard to make work. You'll need oversize soft tire wheels, for leverage, and some custom bucket loader type of sand conveyance. Maybe pedals. And the path can be pretty narrow, like 10 or 12 inches, to ease the load on the machine. Why move the sand in a 20 or 30 inch swath along a continuous path when all you really need is stepping points every 24 inches or so? what if the lead person in the group just had shovel fronted shoes and walked with a scuffing/ scraping and flicking action to create the alternating left and right cool patches for the rest of the group to walk on. I've seen people walk through hot sand by 'wading' through the sand, thus pushing the top layer aside as they walked. If the sand is loose enough this works fine. Wernt sedan chairs invented for this sort of situation? Perhaps the machine could use the temperature differential of the sand to power itself? What would be really cool would be a device to both desalinate water and cool the sand.